We are on a mission to update our place. We had really wanted to build a house and had even gone as far as talking to a builder. But where we are right now in our lives, we decided that the best thing to do would be to postpone that idea and work on our home. We currently live in a mobile home, and square footage-wise it is bigger than the bungalow that we moved from. However our bungalow had a ton of built in storage that I miss. A lot! Steve has promised to build me some built-in book shelves this winter and I can hardly wait! But in the mean time, we have set out to beautify the place a little bit. I showed you pictures of our front door that I painted and our french door in the back that had to be completely taken out due to rotting headers and footers. It looks so much better! We will also be putting new siding on due to our present siding being rotten in more places than what we originally thought. We also hope to take out the underpinning and put in a rock or a decorative cement block foundation. And Steve has already built one shutter to see if we would like it. We did! It should look a lot better when all of that happens! I can't wait to share those projects with you! Our latest beautification project was made possible by Pinterest. I can just imagine what Steve does whenever he gets a notification that I have sent him a pin. 9 times out of 10 it means more work for him. What is so wonderful is that I don't ever hear him complain about it. He may tell me why it wouldn't work, or wouldn't be possible for us, but he is always open to new ideas and will at least give them serious thought. Thanks honey! This specific pin was for trim work around windows. 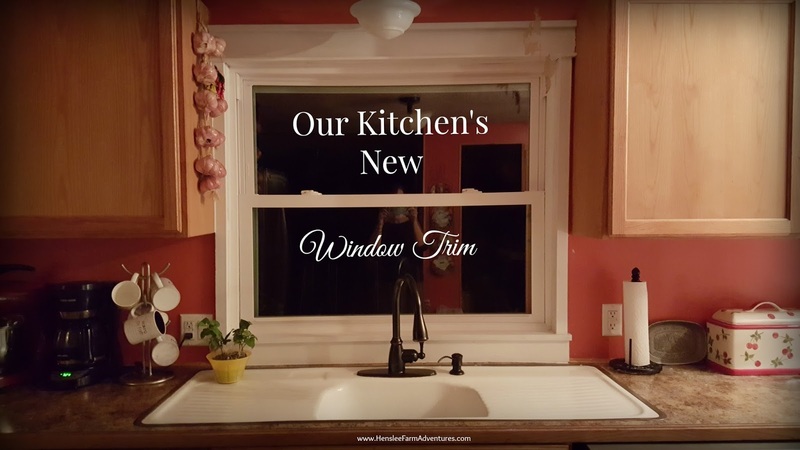 We had new windows installed early this year and it was a very good decision! Our utility bill went down, in the first month by $100.00! It has stayed down every month since, so they will eventually pay for themselves in the long run. 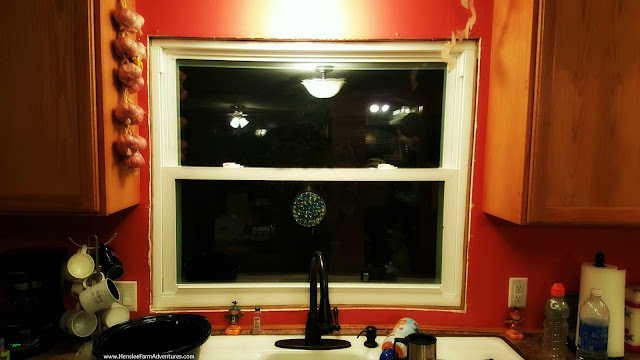 So with new windows, we really needed new trim. The trim that we had around some of the windows was just the wood corner round. On our kitchen window it was the plastic corner round. Needless to say, it did not look good. We took it down and for months, our kitchen window has been trim-less. 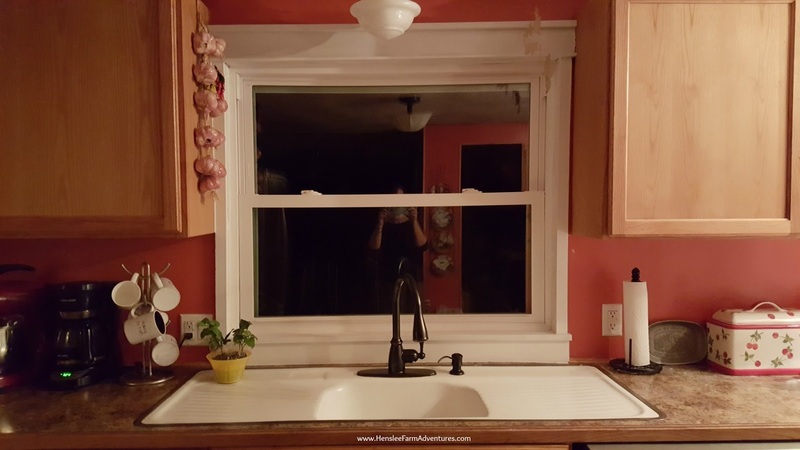 No trim, messy kitchen, and picture taken at night equals one ugly mess! I sent Steve several pictures of trims that I liked and we agreed and what we wanted. We didn't follow one pin over another, we just took ideas and measurements and went with what we liked and what would work for our window. Now comes the simple living, self-reliant part...we used lumber we already had on hand. That's what I love about this! It didn't cost us a dime. Now if we want to do more windows, which we do, we will have to buy some lumber. But for this first window, we didn't have to. You may notice in the picture that the drywall below the window is bowed up. The people that installed the window was supposed to fix that, but they didn't. We weren't real happy with that and Steve was toying with the idea of removing the window, fixing the frame and then reinstalling it. Neither of us really wanted to do that. Well with the trim that we choose, we were able to hide the fact that it was not level. Clean kitchen, pretty trim, picture still at night equals much prettier site! I love the trim work that he did. The best part is that it has a ledge! It is not a big ledge, but just big enough I could put a small plant on it. Steve is planning on tackling the other windows on the days that he can't work on the outside of our house. Slowly but surely, our place will become beautiful once again. Let me know in the comments below what you think about the trim. Thank you, we have one window down and a lot more to go. ;-) Steve will be busy this winter!